Israel's parliament passed a contentious law that would permit the force-feeding of inmates on hunger strike, eliciting harsh criticism over the practice. The law allows a judge to sanction the force-feeding or administration of medical treatment if there is a threat to the inmate's life, even if the prisoner refuses. It passed with a 46-40 vote in favor _ a slender margin in the 120-seat Knesset. The remaining lawmakers were absent from the early morning vote. While the law applies to all prisoners held in Israeli jails, Palestinian prisoners have used hunger strikes as a tool to draw attention to their detention without trial or charges. Scores of Palestinian inmates have held rounds of hunger strikes over recent years. Many prisoners have been hospitalised and their failing health has caused tensions to flare among Palestinians. Israel fears that a hunger striking prisoner's death could trigger unrest. 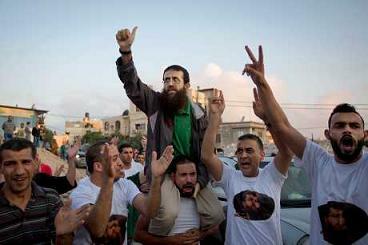 Israel in the past has acceded to hunger-striking prisoners' demands and at times has released prisoners. Pictured, Palestinian Khader Adnan, center, ended a 55-day hunger strike and ws freed last month). “The law creates the right balance between the state's interest to protect the prisoner's life and his rights and sovereignty over his body,'' said David Amsalem, a lawmaker with the ruling Likud party who backed the law. Under the new law, Israel's prison service would need to seek permission from the attorney general to ask a judge to allow the force-feeding of a prisoner. The judge would then weigh a doctor's opinion, the prisoner's position as well as security considerations before ruling in the matter, according to Amany Daiyf, from the group Physicians for Human Rights-Israel, which opposes the law. “Israeli doctors ... will continue to act according to medical ethical norms that completely prohibit doctors from participating in torture and force-feeding amounts to torture,'' said Leonid Eidelman, the head of the association. Physicians for Human Rights-Israel, said the law is political, meant to prevent violence sparked by hunger striking prisoners rather than protect the prisoner's dignity and well-being. The fate of the prisoners is deeply emotional for Palestinians, where nearly everyone has a neighbor or relative who has spent time in an Israeli jail. Palestinians view the thousands of prisoners held by Israel as heroes. Several hundred are held in administrative detention, according to the Palestinian prisoner advocacy group Addameer, where they can be held for months or years without charge or trial.